Later today, I'll post more pictures of my Xmas Mini Album. It's almost complete, except for three more tags and possibly some other embellishments. I haven't decided whether I will add pictures from last year or save it for this year. 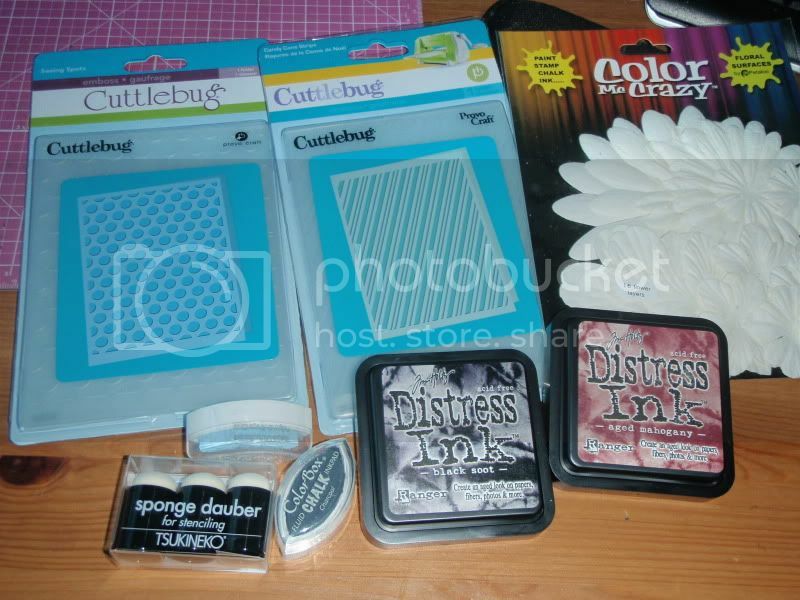 Anyway, here's what was waiting for me in my mailbox from Scrapbookpal.com. I love ordering from this vendor because just like Amazon, shipping is free over $25. The two Cuttlebug folders are "Seeing Spots" and "Candy Cane Stripe." ColorBox Chalk ink in "Charcoal" and "Ice Blue"
Ranger's Distress Ink in "Aged Mahogany" and "Black Soot"
Plain assorted flowers to stamp or and glimmer mist.